according to its hormone receptor status e.g. oestrogen receptor ER+ve or ER-ve / progesterone receptor PR+ve or –ve. 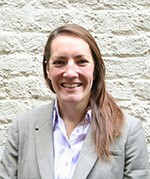 Breast cancer risk doubles each decade until the menopause, after which the increase slows but there is strong evidence that your risk can be reduced by adhering to WCRF recommendations to be within the healthy weight category, physically active (especially vigorous for premenopausal breast cancer) and by limiting alcohol consumption to not more than one drink a day (if at all). In addition greater weight gain in adulthood increases the risk of postmenopausal breast cancer. Breast feeding also reduces risk in both pre and post menopausal breast cancer. 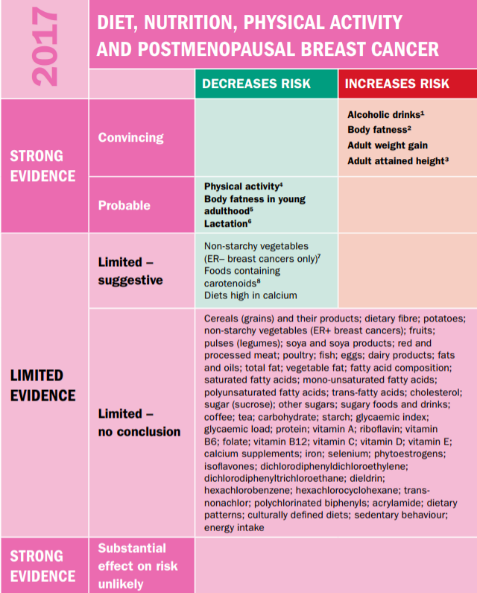 There is limited evidence that eating certain foods may reduce the risk too e.g. non-starchy vegetables (ER-ve only), carotenoids, dairy foods and a high calcium diet. 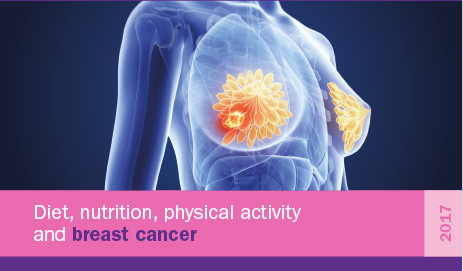 This is the most comprehensive and up to date report on lifestyle and breast cancer risk which also reviews existing data on possible mechanisms of how lifestyle factors may impact on breast tissue. 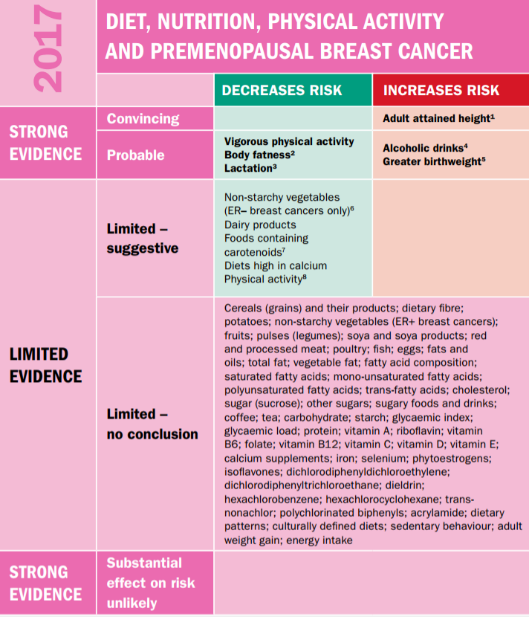 This CUP report on breast cancer includes new evidence published since the Second Expert Report (Section 7.10) and the 2010 CUP Breast Cancer Report. 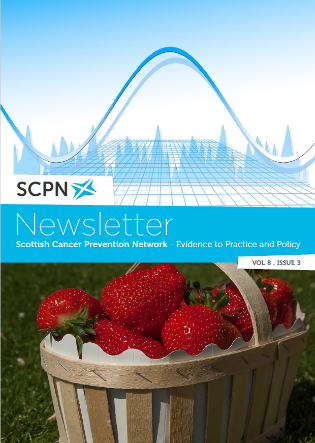 Following the recent publication of the WCRF CUP report on ‘Diet, nutrition, physical activity and breast cancer’, we asked Susannah Brown, Senior Scientist, WCRF if she could respond to some questions for us. What are the possible reasons for the link between alcohol intake and breast cancer? The mechanisms for how alcohol acts to influence breast cancer risk in women are complex. Alcohol is metabolised principally by the liver, but also in breast tissue, to acetaldehyde, potentially producing reactive oxygen species associated with DNA damage and initiating the cancer cascade. Alcohol also acts as a solvent, potentially enhancing penetration of carcinogens into cells. Alcohol may have significant impacts upon endocrine and growth factor networks that affect breast carcinogenesis. For example, in some studies alcohol may increase circulating levels of oestrogen, which could affect susceptibility to transformation or promote cancer growth. The risk of cancer for alcohol drinkers may be altered by genetic factors. How relevant is alcohol consumption in early adulthood and breast cancer? We did not have the data that would allow us to compare the effects on breast cancer risk of drinking alcohol in early adulthood with drinking later in life. However, alcohol consumption was strongly linked to an increased risk of breast cancer diagnosed in women both before and after the menopause. We also observed that the risk of breast cancer is greatest in those that drank the most alcohol across a number of years. How do we juggle the evidence on alcohol benefits for heart disease compared to risk for breast cancer? Research has shown that people who drink small amounts of alcohol may have lower risk of coronary heart disease (CHD) compared to non-drinkers. The protective effect is seen at very low levels of consumption (around one unit a day) and limited to specific population groups. Any benefit of drinking alcohol found for heart disease is negligible when you consider the significant increased risk of several cancers, including breast cancer, from drinking alcohol. It is important that people understand that any type of alcohol, including red wine, which people typically think is a healthier choice, still increases cancer risk. This is because all alcohol types contain ethanol, which is the compound that increases the cancer risk. Should women who have had a breast cancer diagnosis become teetotal? For cancer prevention, we know that it is best to not drink any alcohol, so it would be sensible to consider that refraining from drinking after a cancer diagnosis would also be beneficial for cancer survival. In 2013, we analysed research on whether alcohol influenced the risk of surviving breast cancer. No significant results were found, although at that time there were only a limited number of studies available for review – more research is needed in this area.